Last Friday, I had the opportunity of a lifetime. I am currently a marketing major who is enrolled in an advertising class, which has made me consider pursuing the field. Not going to lie, I am also in the midst of watching Mad Men on Netflix and The Pitch for my advertising class, and both have kept the thought in my head. So when I received an email from the Dean's Business Scholars Program, of which I am a member, letting us know about a visit to DDB Worldwide, I was in. For some background, the Business Scholars Program is made up of high-achieving students with the aim to expose them to different areas of business through luncheons, company visits, and engagement with Executives in Residence. 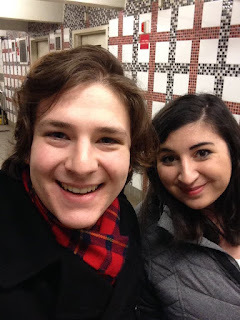 My friend Christine and I were off to Manhattan with the help of the Hofstra Shuttle and the Long Island Rail Road. After a quick breakfast break in Penn Station, we hopped onto the E train uptown to 5th and 53rd. Three blocks later we were in the lobby, waiting for everyone else to arrive. We piled into the elevator and headed up to the 11th floor. We were brought into a large conference room with the DDB logo on a large TV. We did brief introductions, and then Jennifer Novak, Global Head of Creative Talent Recruiting and organizer of the trip, introduced Keith Reinhard. Mr. Reinhard is an inductee of the Advertising Hall of Fame and has immensely impacted the advertising industry. Not only were McDonald's Hamburglar and State Farm's "Like a good neighbor, State Farm is there" his brainchildren, but he helped create one of the industry's largest networks, Omnicom, as well. He answered a list of questions we had sent him prior to arrival and told stories from his experience. Not only was he well spoken, but you could really feel the passion in his voice when he spoke. Hearing about his favorite campaigns and his journey moved me and my fellow classmates, so much that we went over the allotted time because we had so many questions. We then heard from a few members of the DDB New York office; Senior Copywriter Tyler Kirsch, Creative Rachel Newell, and Account Lead David Reyes. They spoke to their roles in the creative process. Account Leads will get the information for a client such as target market and product details, and then give the creative team direction for the campaign. The Art Director will generally work with copywriters and creatives to start producing content and bring the idea to reality. Hearing about this process from employees was so beneficial as it was clear that they love their careers and have fun with what they do. This really resonated with me because all I want is to love what I end up doing. Collaborative work stations, featuring a birthday surprise! To wrap things up, we toured the Creative floor, which was changed to an open floor setting. This was done to encourage discussion among co-workers and have an environment where ideas are able to flow easier for collaboration. As we walked through, I noticed how the company culture can easily contribute to the love and passion DDB employees were expressing throughout the day. There were decorations on work stations, and there were board games and client products out to encourage brainstorming and increase product knowledge. Working in this type of culture, it was no surprise to see all the awards DBB has won on a shelf when I turned the corner. The visit came to an end with a group photo around Ronald McDonald, as well as a sense of reassurance for my future when I left the building.